South East Appliance Service in Aurora, CO has been repairing and servicing major appliances in the South and East (hence the spelling of southeast as two words) areas of the Denver, CO metro area since the mid ’70s. 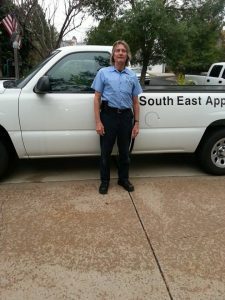 I have been servicing appliances since 1980 and took over South East Appliance in 1985. I currently service South Aurora, East Aurora, and East Centennial Colorado. Check out my latest specials. Be sure to browse my helpful hints. I repair most brands of washers, dryers, refrigerators, ranges, cooktops, ovens, dishwashers, stoves, freezers, ice makers, and more. Sorry, not LG or Samsung.